Stairway to Heaven, also seen is Bethnal Green tube station, CoE St John Church and Salmon and Ball public house. The Hare is one of the last two public houses in Cambridge Heath area that has been opened since before 1900. An ex-Truman establishment, it is now a free house. The former Bethnal Green Infirmary, later renamed the Bethnal Green Hospital, was built on land purchased from the London Society for Promoting Christianity amongst the Jews, however used began to declined due to cutbacks in the NHS and it closed as a public hospital in the 1970s and the role of the hospital changed from acute to geriatric care, staff occupied the building as part of a campaign to protect its future, however the administrators moved out but patients remained, their for the NHS was obliged to pay the staff to carry on performing their duties until after the 1980s. But the old hospital entrance and administration block remains as a listed building. 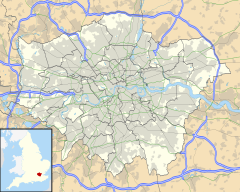 Bethnal Green (including Cambridge Heath) is in the constituency of Bethnal Green and Bow, represented in the House of Commons of the UK Parliament since 2010 by Rushanara Ali of the Labour Party. London overall has a directly elected executive Mayor of London, currently Sadiq Khan and the City and East seat in the London Assembly is held by the Labour Party Unmesh Desai. The district is associated with the E2 postcode district, but this also covers parts of Shoreditch, Haggerston and Bow. Between 1986 and 1992, the name Bethnal Green was applied to one of seven neighbourhoods to which power was devolved from the council. This resulted in replacement of much of the street signage in the area that remains in place. 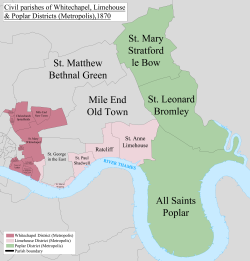 This included parts of both Cambridge Heath and Whitechapel (north of the Whitechapel Road) being more associated with the post code and administrative simplicity than the historic districts. On 3 March 1943, the air-raid Civil defence siren sounded at 8:17 pm, causing a flow of people down the staircase which had no lights on from the street level into the incomplete Bethnal Green tube station, which had been requisitioned in 1940 by the Metropolitan Borough of Bethnal Green under the supervision of the Regional Commissioners. The panic itself began at 8:27 coinciding with the sound of an anti-aircraft battery (possibly the recently installed Z battery) being fired at nearby Victoria Park. In the wet, dark conditions the crowd was surging forward towards the shelter when a woman tripped on the stairs, causing many others to fall. Within a few seconds 300 people were crushed into the tiny stairwell, resulting in 173 deaths (most of whom were women and children) were crushed and asphyxiated. Although a report was filed by Eric Linden with the Daily Mail, who witnessed it, it never ran. The story which was reported instead was that there had been a direct hit by a German bomb. The results of the official investigation were not released until 1946. A plaque at the entrance to the tube station commemorates it as the worst civilian disaster of the Second World War; and a larger memorial, "Stairway to Heaven", stands in nearby Bethnal Park. This memorial was unveiled in December 2017 at a ceremony attended by Mayor of London Sadiq Khan and Bethnal Green and Bow MP Rushanara Ali. Bethnal Green has numerous primary schools serving children aged three to 11. St. Matthias School on Bacon Street, off Brick Lane, is over a century old and uses the Seal of the old Metropolitan Borough of Bethnal Green as its badge and emblem. The school is linked with the nearby 18th-century St. Matthew's Church on St. Matthew's Row. The Bangabandhu Primary School, named after the father of Bangladesh, Sheikh Mujib, a non-selective state community school, was opened in January 1989, moved to a new building in November 1991, and has over 450 pupils. 70% of the school's pupils speak English as a second language, with a majority speaking Sylheti, a dialect of Bengali, at home. One of several independent schools in the area, Gatehouse School, near Victoria Park, was established in 1948, and follows a Montessori-style curriculum for younger pupils. Bethnal Green was a temporary London terminus and first main line terminal from East London which was called Devonshire Street, located on Morpeth Street for the Eastern Counties Railway (ECR) from Romford prior to the construction of Shoreditch station which became the permanent terminus and Devonshire Street was closed in 1840. Bethnal Green Junction, now just Bethnal Green from 1946 (not to be confused with the much later London Underground station of the same name) and Cambridge Heath railway stations are both on the London Overground network and were both opened by the Great Eastern Railway (GER) on the Lea Valley Lines in 1872 as part of a more direct route to Enfield Town. The GER opened two additional tracks now known as the Fast Lines that allow longer distance trains to bypass the stations, it was also formerly served by trains on the Great Eastern Main Line (GEML) via Stratford and has had two derailments in the later 20th century due to it role as a junction. Bethnal Green tube station opened on 4 December 1946 on the Central Line and is between Liverpool Street and Mile End on the London Underground, however construction of the Central line's eastern extension into then-Essex was started in the 1930s, and the tunnels were largely complete at the outbreak of the Second World War although rails were not laid and was a site of a major wartime disaster during the war due to a air-raid Civil Defence siren sounded in error, caused by the discharge of anti-aircraft rockets during test firing and is the largest loss of life in a single incident on the London Underground network. Bethnal Green has been part of the Night Tube service since 2016. On 25 September 1993, route 309 started running between Bethnal Green and Poplar. It was intended to start from the London Chest Hospital but this was delayed due to speed hump problems and their for started and ended at Three Colt Lane instead. It was finally extended from Bethnal Green Station to Chest Hospital in 1995. Non-League football club Bethnal Green United F.C. plays at Mile End Stadium. Now known as Tower Hamlets FC (since 2014-15 season), it plays in the Essex Senior League. Another locally based team also based at Mile End Stadium are Sporting Bengal FC. The boxer Joe Anderson, 'All England' champion of 1897, was from Bethnal Green. ^ "Vibrant heart of the East End - Review of Bethnal Green, London, England". TripAdvisor. ^ "Lost Hospitals of London". ezitis.myzen.co.uk. ^ "London Bus Route 309". www.londonbuses.co.uk. Retrieved 31 March 2019.